Add to bag (1029)You have already bought this product. 1.Please see the Size Reference to find the correct size! 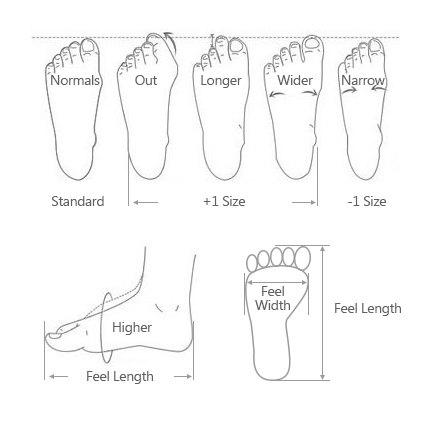 2.We suggest you choose size according to foot length and foot width. 3.These are handmade products so it may take more time to produce than other shoes. 4.As these shoes are hand-colored, there may be a certain odor.After receiving the goods,putting them in a well-ventilated place can eliminate the smell. 5.The shoes are genuine leather products that are able to have a little contact with water but they can not be soaked in water for a long time. Ilike it and the size, it's perfect ! Thank you ! NC-Staff: Dear sir/madam, thank you for your review. The measurements of the product are listed on our size guide. To choose a correct size, we kindly suggest that you can measure your own size and then read the guidance of size choosing on our product page instead of choosing a size based on your usual size since some tag size may be different from our size chart’s size number. If you need further help for the size of the item, please send us some photos of the item as well as SKU sticker and the shipping label via this link : https://www.newchic.com/Contact-Us-hc10.html We will do the best to help you. wonderful! and very colourfull - nice shoes! 1. Please according your own measurements to choose your suitable size. 2. This sizes listed is based on international sizing system,Please see the Size chart Guide to find the correct size. About Size:Size may be 2cm/1 inch inaccuracy due to hand measure. These measurements are meant as a guide to help you select the correct size. Please take your own measurements and choose your size accordingly. About Color:The precise color of the items may vary depending on the specific monitor, the settings and the lighting conditions. The items colors depicted should only be used as an approximate guide.